Jmez Media offer three comprehensive New Business Media Packages for new business start-ups, fixed budgets and new clients. All three provide the essential media ‘head-start’ ingredients needed to get a company off the ground or refresh a dated company profile and make it visible and equipped to start generating or increasing sales leads. Which option to go for is a matter of choice, the level of personal involvement desired.. and budget. Media marketing is essential in promoting a businesses services and the costs of preparing a new company for launch should be integrated in an initial business plan. Our fixed price packages are a great way to ensuring the best possible path forward but should not be regarded as a ‘ticked box’ but the start of a longer term strategy. Logos are created based on client ideology, their product and service range and prospective market-place. After client consultation, Jmez Media produce a series of themed designs, finesse the preferred choice and prepare resolution ready version for use on stationery and product branding, on banners and hoardings and for online purposes such as website and social media. With a company logo established, Jmez Media will create client headed paper, up to ten named business cards, compliment slips – invoice forms and associated forms (up to eight), presented ready for print. Jmez Media’s print partner companies specialise in all forms of printing, from simple printed stationery to shop hoardings, estate agent boards, van and truck vinyls, banners, brochures, leaflets and catalogues. Using print partners as we do, ensures the right printer for the right job. N.B. Print costs are variable and not included in start pack prices. Where a client has their preferred choice of printer, we are happy to oblige. The first advert.! Can be text or graphic based. Jmez Media will create the key graphic if necessary or use image/s supplied. The logo and strap line is typically included along with whatever message needs to be carried. We will produce the advert in portrait or landscape mode as required and will supply (resolution) versions for intended use in both print and online media. Our preferred build platform is currently WordPress (we will build via Drupal or Joomla or even our own RipeWebsite Manager if specifically requested). Client websites are not size restricted. Jmez Media use Jupiter 5 theme and Visual Composer (which makes client self-editing a simpler affair). We create the menu system, page layout (design) and associated graphics (such as logo and header banners). For Eximius sites we require clients to provide their own text content and any additional images they want to use in their website. For Praestabilis and Summitatem websites, Jmez Media Media will research and create client product/services text content (up to 5000 words). Links to social media and external websites (where required) are standard and each website is made ready for public view. Domain Name. Jmez Media purchase & register client domain names (i.e. www.mywebsite.com) where required. We take care of attaching the domain name to the website and submitting the domain name to Google search engine for indexing. N.B. Purchasing domain names is subject to their availability at the registrar. Email. With a domain name and Jmez Media web hosting comes the ability to use email. (i.e. www.mywebsite.com could use [email protected] or personal mails such as [email protected] or [email protected] etc). Jmez Media do not impose any limit to the number of email accounts created or in use. Jmez Media set up client social media through a selection of options. Typically we include Facebook, Twitter, Instagram and LinkedIn and will create the respective accounts. There are many other social media options which, depending on client requirement, we can assist with. We recommend to a third party agent should you wish your social media accounts to be fully managed for you.. In every event we link social media accounts to the client website and will submit starter posts to each media. Get to grips with Photoshop.. create.. edit.. enjoy..! Want to learn how to edit your own website..? ..get some one to one tuition. We'll guide you through the basics and beyond.. The information provided on this website has been compiled for your convenience. Jmez Media UK Ltd makes no warranties about the accuracy or completeness of any information contained on this website. 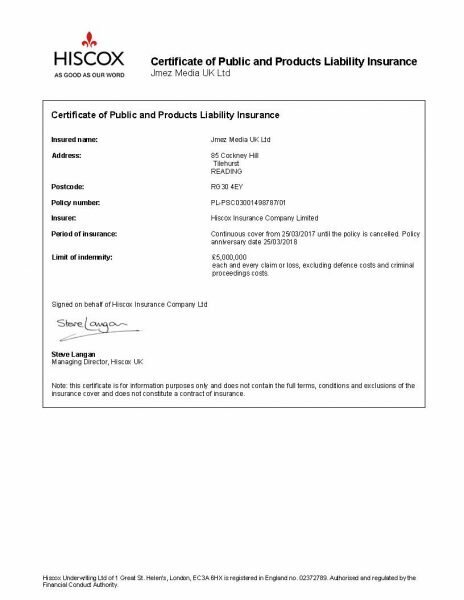 Jmez Media UK Ltd, including its directors, affiliates, officers, employees, agents, contractors, successors and assigns, will not accept any liability for any loss, damage or other injury resulting from its use. Links to other websites are provided for your convenience and Jmez Media UK Ltd is not responsible for the information contained on those web sites. The provision of a link to another website does not constitute an endorsement or approval of that website, or any products or services offered on that website, by Jmez Media UK Ltd. Jmez Media UK Ltd will not accept any liability for the use of those links to connect to websites that are not under our control. Jmez Media UK Ltd holds the copyright to this website. It grants you a limited licence to download this website for personal use only. You are not permitted to reproduce or alter this website, or any copy of it, for any other purpose without the prior express written consent of Jmez Media UK Ltd.
Jmez Media UK Ltd regards your privacy as important and will take all reasonable steps to ensure that if you have subscribed to receive notification of website updates, your email address will remain confidential. Jmez Media UK Ltd reserves the right to make changes, modifications, additions, deletions and corrections to the website, at any time and without notice. A logo is the shape or symbol that identifies a company. It is used to instantly identify the company’s brand. The brand is the product packaging, the commercials, press advertising, shop hoardings, website, music jingles and every contact point with the company. It is the brand that triggers an emotional and intellectual response in people – who instantly know what the company sells or provides. We could create a beautiful logo in our studio today and paste it on billboards, post it in press advertisements, on the sides of trucks.. but if there is no brand, people will not identify the service or product we want the logo to represent. Building a brand is akin to building trust in a company’s products or services. The more visible the company, the more people will accept the brand as a viable option.